The General Director of the Internal Security Forces in Gaza, survived an assassination attempt, Friday, with mild wounds, after an explosive device, which was apparently embedded in his car, detonated as he opened its door. Security sources in Gaza said Lieutenant Tawfiq Abu Na’im, survived the explosion which targeted him after Friday noon prayers, at a local mosque in the Nusseirat refugee camp, in central Gaza. The blast also mildly injured a few other Palestinians. He was rushed to the Shifa hospital, in Gaza, after suffering minor injuries, and is expected to be released the same day. Following the blast, Palestinian police and security officers rushed to the scene, and initiated an investigation into the incident. It is worth mentioning that Na’im was a former political prisoner, held by Israel, and was released in 2011, as part of the Shalit Swap agreement. 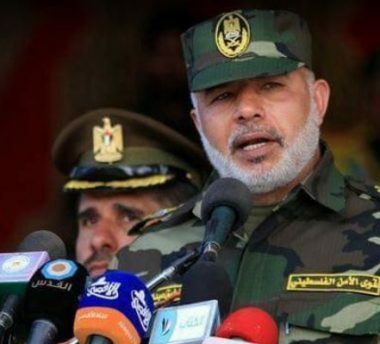 Ismail Haniyya, the head of Hamas Political Bureau, visited the wounded Lieutenant, and held Israel, and its collaborators, responsible for the assassination attempt. Haniyya added that Israel is trying to sabotage the reconciliation between Hamas and Fateh movements, and called on all factions, and President Mahmoud Abbas, to speed up all measures aiming at implementing all sections of the unity agreement, to enable a strong and united internal front.